What Are Implant Supported Dentures in East Islip? When you are missing multiple teeth it takes a toll on every aspect of your life. Talking, eating, smiling and chewing become difficult and even embarrassing. Your confidence suffers because you feel self-conscious about smiling and talking in front of others. Your digestive health suffers because you can’t chew your food properly. You may even feel begin to feel hopeless, however there are some great treatment options for those missing most or all of their teeth, so never lose hope! Your premiere dental team at East Islip Dental Care has options for you. 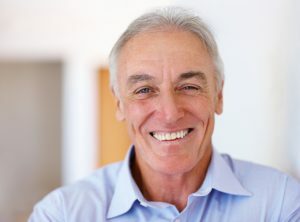 Here’s more information about implant supported dentures in East Islip. A denture is a removable appliance with prosthetic teeth attached, typically made of acrylic, that is designed replace an entire arch of teeth. Dentures rely on a snug fit and suction to the jawbone to stay in place, and it does take some getting used to at first. Patients who wear dentures often complain about the time it takes to learn how to talk and eat again, as they may sometimes move or slip. Implant supported dentures have revolutionized the way that patients wear their dentures. By strategically placing dental implants in your jawbone, your dentist will custom design your dentures to attach to the dental implants. After the appropriate healing time has passed your denture will be permanently attached to your implants and naturally complete your smile. One of the greatest benefits that implant supported dentures offer is the secure fit. Because your denture attaches to your implants, there’s no movement or slippage when you eat or talk, and no learning curve. Patients appreciate the way that these dentures restore beauty and function to their smile immediately. Implants also help to restore your oral health by protecting your bone from deterioration. When you’re missing your teeth and roots, your jawbone begins to resorb and lose density over time. This changes the appearance of your face and affects your oral health by putting remaining teeth at risk for loss. At East Islip Dental Care, our highly skilled team of doctors can help restore your smile and your confidence. Dr. Julie Boerger specializes in dental prosthetics, and she combines artistry with dentistry to give patients dentures and partials that look and feel just like their natural teeth. Dr. Benjamin Neren has also joined our team. In addition to his skills as a general dentist, he is a prosthodontist specializing in this area. The result is a beautiful smile that you’ll be proud of once again! Don’t let missing teeth keep you from living the life you deserve any longer. Contact our office today to learn more about how we can restore your smile. Comments Off on What Are Implant Supported Dentures in East Islip?